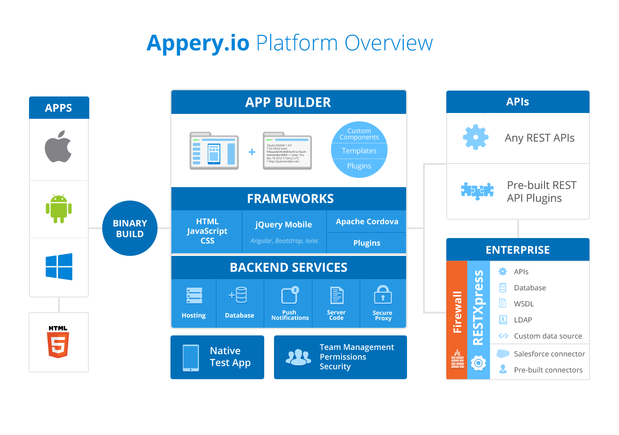 Appery.io is a rather capable cloud-based mobile Web and hybrid mobile development platform with online visual design and programming tools, as well as integrated back-end services. You can think of it as a cross between an app builder and an MBaaS (mobile back end as a service). Appery.io can talk to essentially any REST APIs, whether or not the company has prebuilt the interface. Tying a prebuilt REST interface to a service is a matter of a few minutes. Building the REST interface yourself takes a little longer and requires knowing a little more, but it’s not a big job. Figure 1. The Appery.io platform centers on a hosted, browser-based app builder that generates HTML5 code, using jQuery Mobile and Apache Cordova wrappers. The system also provides back-end services, hosted build services, and REST interfaces to external databases and applications.